Looking at the map we see a red line running from Osh to Bishkek. It is a highway and actually still the M41. We are reluctant to take this road because we prefer to avoid heavy traffic and take smaller roads where possible. At the same time we have heard that many of the smaller roads are closed due to snow on the high passes. So we decide to take the highway anyway and this proved to be a nice choice. We didn’t know before hand but the road we took was actually a really good way to be discovering the diversity of Kyrgyzstan. All photos can be seen here: Osh and Jalal-Abad, Karakol and Toktogul, Ala Bel pass and Too Ashuu pass and Bishkek. 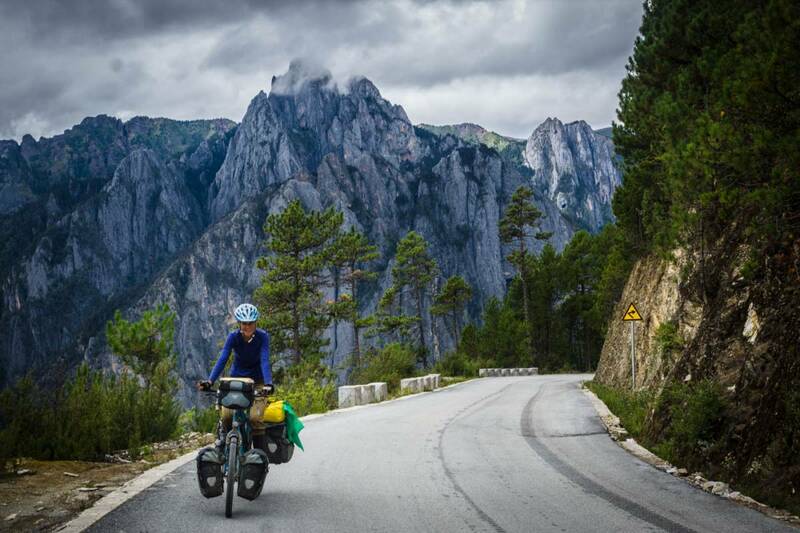 Bicycle touring is much more a mental thing than a physical thing. As long as your mind thinks you can do it then you will do it. 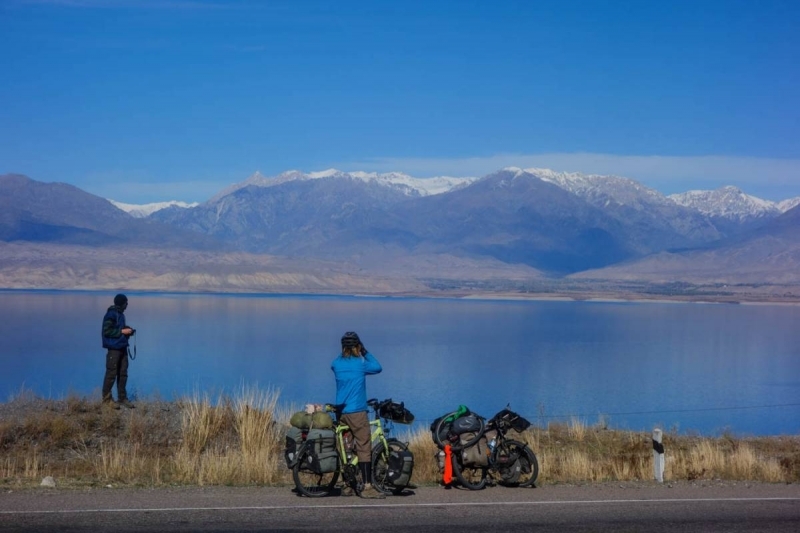 After nine months of cycling we had become very comfortable in Osh for a few days and it was hard to leave these comforts behind and start cycling again. Also the scenery during the first days back on the road was not so interesting and traffic was heavy and driving a little bit crazy. 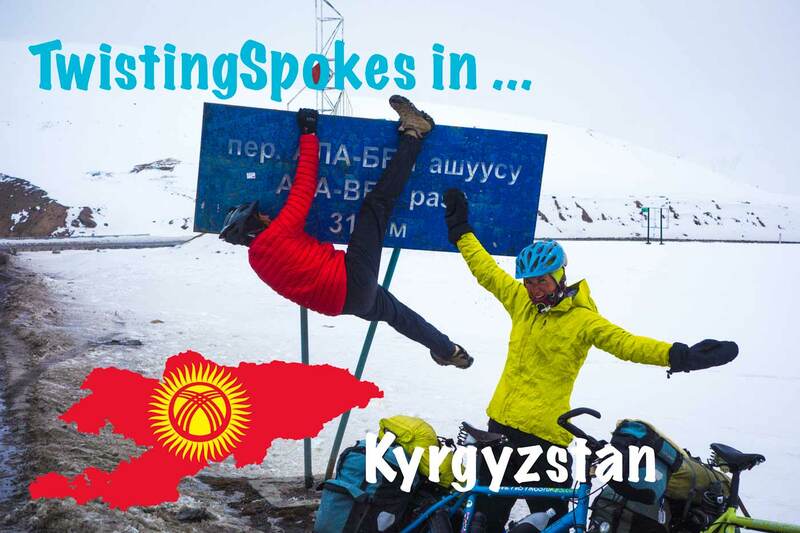 We told ourselves that we needed to get into the feeling again and had to enjoy being on the road instead of trying to get to Bishkek as soon as possible. On day three we started to relax and enjoy. We were cycling with the three of us, by the way, because we were still joined by Bertrand, the crazy french cyclist from Ca Roule. It was nice being together, talking a lot, cycling and making dinner together in the evenings. After one third of the total distance to Bishkek the road started to change. We were following the river Naryn with a lot of up and down and gradually climbing up. The scenery was more interesting because the river was beautifully blue and the mountains were increasing. We enjoyed some pancakes on the road to Karakol and started the first small pass. We mixed camping with staying at small restaurants and actually ate out a lot during the nine days it took us to get to Bishkek. Our favourite meal was Bifschteck (or something that sounds like this), a combination dish of pasta, rice, buckwheat, beef burger and egg. A lot of good carbohydrates and proteins. Also Laghman, a local noodle dish, goulash and kebabs were enjoyed by us always together with at least two pots of tea to rehydrate and warm up. We met some interesting people along the way. Babushka, an older woman owning a restaurant and a lot of land served us the most delicious apricot and raspberry jam. She showed us a booklet from a popular horseshoe that is touring around in the United States and Europe. Apparently one of her children is working for the horseshow as a stunt rider and is married to a french woman. Another child worked in Russia and one more in Bishkek and then there was the daughter that was running the restaurant and the household. We were allowed to sleep in one of the rooms and the beds were made up for us. Very sweet. In Karakul we met Merim who saved us on the streets. She asked if she could help when we were looking for a place to stay but the hotel in town was too shabby and too expensive and we didn’t want to backtrack to another hotel. Merim spoke German and was interested to practice her German with our limited German conversational skills, but we managed. She was very sweet and gave us fruit and cheeseballs to take with us the next day. From here on we knew we had to cycled around Toktogul lake, we wonder why nobody ever thought of introducing a ferry to cross it, and then the first pass would start. The views were getting more pretty by the minute and we were enjoying ourselves. It was really nice to see horses walking themselves in the fields and crossing roads and to see huge hunting birds circling the valley and waiting patient, searching for their prey. From the moment we started ascending there were a lot of small restaurants selling fish and shops selling honey along the road. We made up camp at a hotel that was closed for the season and was now only used for taking wedding photos. The next day we finally made it up to the pass. The day was a bit gray and at the end it even started snowing just before we reached the top of the steep pass. We think we even saw a fox, but it might have been a dog. We were very happy reaching the top because it had been a tough climb all the way from 900 meters to almost 3200 meters in two days. Celebrations were in order but we also knew we had to descend and climb another pass very soon. We made it to the village of Otmok where we deliberated if we would cycle on or stop for the day. We made calculations about the next day climbing up to the pass and decided we could stay in the guesthouse and have a nice dinner. Just inside we noticed that in the communal sleeping area there was a familiar sticker. Dimitri and Gulnara who we met in Bukhara from Nexus Expedition had also stayed in the same room. The next morning started off beautiful because we were cycling above the clouds. Very pretty! But after 20 kilometers of going downhill we were cycling in the clouds and were surrounded by thick grey fog. Little bit spooky. 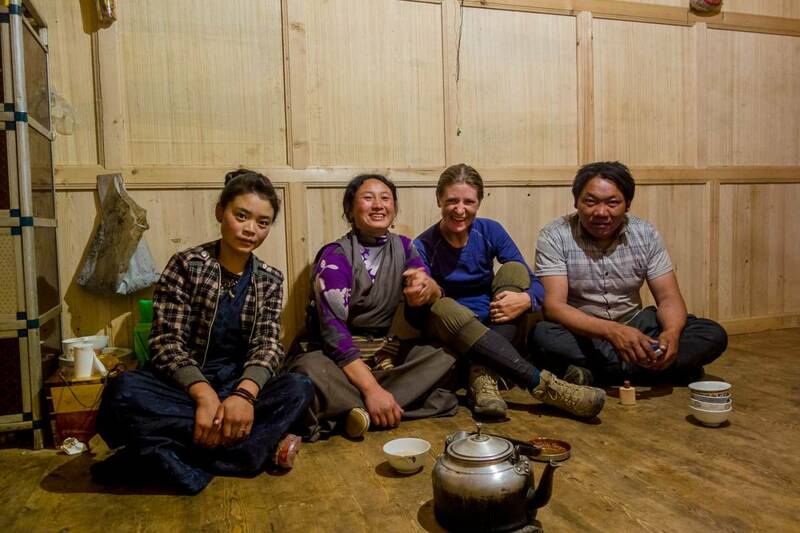 We reached another village where we had a delicious early lunch and some tea to prepare us for the last pass. By now the pressure was a bit heavy for Susanne. everyday on this section had been a bit tough with winter coming and the pressure of cycling with two men. Although they would wait for her overtime without any worries. She tried to keep up with them but the speed sometimes just is a bit too fast. After having cycled up 200 height meters the men were far in front and she had a breakdown (I am writing this about myself :). Not unusual, but really annoying. It sometimes happens at the start of the day or before an ascent and it really is a mental thing. She is getting more flexible but still the breakdowns and tantrums occur. Martin said: ”What do you want to do? Take a truck?”. Susanne decided “No”, and slowly started cycling. Martin was waiting for her every 200 meters up and after two sections she was very happy to have made this decision. Although the road up the pass was still very long and the going was slow. It was a pass with real switchbacks which actually is nicer to cycle than when a road just goes up along a river. Progress is faster and you can see from a distance where you are going but on the road itself the parts to cycle seem shorter because the overview is better. We pass a sign to a ski-resort and finally ride around the last corner and see the impressive tunnel of doom. In 2001 this tunnel was the scene of a large accident with fatalities. We had been told that conditions have become better but we had to see for ourselves. We were told that we could cycle through. Nowadays trucks can only enter one side at a time and are stopped on the other side by a traffic light. We put on all our reflective clothing and extra lights and started cycling. The tarmac in the tunnel, contrary to the road going up, was very bad and uneven, so although the tunnel was sloping slightly downward we couldn’t go too fast for the 2,6 km. We couldn’t hear the traffic from behind because the ventilators were making a lot of noise and the tunnel was lit but only slightly. It was a nerve racking few minutes, but before we knew it we saw light on the other side of the tunnel and we knew we had made it! They had even stopped the trucks from both sides for us, as least that is what we assume, because we didn’t come across any trucks. From here it was a beautiful downhill down a very narrow gorge. It was almost sunset and we needed to find a place to sleep but there was no space on either side, with a river on one side and a cliff face on the other side of the road. Finally we found a valley to our right where we could go up and find a place among a lot of stones. In the morning we met two hunters who were starting up from this valley to go hunting for Ibex and large sheep. All three of us wanted to arrive in Bishkek today and we had more than 100 km left to go. The first 40 were downhill so we made good progress pushing through. The weather was sunny and nice but when we left the mountains behind us we could see a cloud waiting for us. The last 60 km to Bishkek were in the mist, luckily with a nice tailwind. So we made it to Bishkek in good time and found a hostel to stay. It has been a really diverse nine day, first only focused on getting to Bishkek and then really enjoying the ride and each others company and the people along the way.